Le Semnoz is the huge mountain on the west side of Lake Annecy. 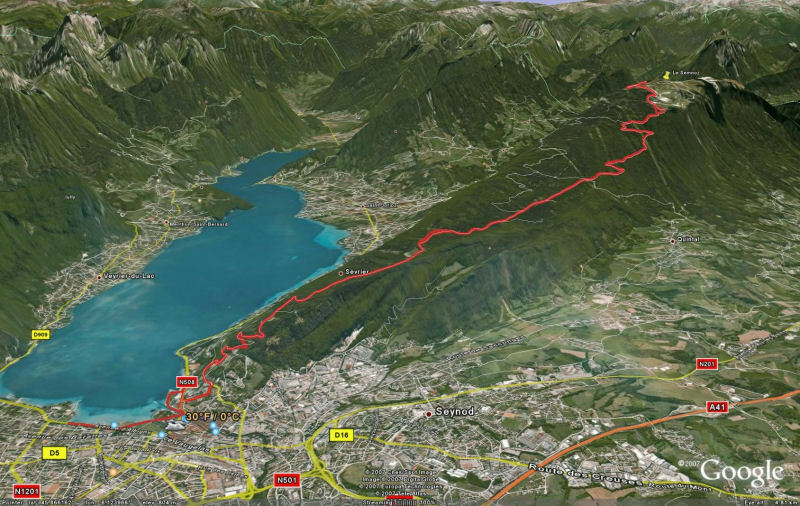 I have climbed it many times from the South side via St Eustache and Col des Leschaux, but today was the first time using the direct route from Annecy – starting near the hospital. It’s a beautiful route through forested roads up to a tiny ski station. 18 kilometres and over 1200 metres (4000 feet) of ascent means this is a fairly big climb. It can be steep in parts and the last 7 kms average about 9%. Up top, on a clear day are good views of the Lake as well as Mont Blanc and other alps. Below: You can see the lake in the bottom left and the white peaks of Mont Blanc in the background (my photos rarely do these views justice). Just to say thanks for the site. I’ve just got back from France after a two week family holiday (with my bike). I’m happy to tell you I got up Le Semnoz (via St Eustache) and the Grand Colombier (via Virieu le Petit). The Grand Colombier was intense, and I took the ‘easy’ route! It was my first time cycling up mountains that steep (I live in Surrey…) and I was skeptical about fitting a third front chain ring before leaving, but I’m so glad I did. Thanks you again for the site. Matt, Fantastic. Those are two tough climbs …. especially Grand Colombier – even the “easy” side is brutal. Very well done. It proved to be the inspiration for my 2 week holiday this July where I covered about 350 miles in 7 rides including Le Semnoz, Col de l’Arpettaz, Cols des Aravis and Saisies and both the local Col de la Forclaz (Montmin and Quiege). Unfortunately I had to abort my attempt of the Signal de Bissane 1.8km frm the top as I had no gas left in the tank as the climb got steeper and steeper as it went on. Unfinshed business that will draw me back to Annecy in a couple of years time to complete the task! Keep up the good work, and I hope to be climbing all of these great climbs on your website eventually!